"The construction of the false Temple on the Temple Mount is closer than ever before," claims an official with the Al-Aqsa Mosque. The head of manuscripts at the Al-Aqsa Mosque, Najeh Bkeirat, has accused Israel of trying to "Judaize" the Temple Mount by building a new Holy Temple. Speaking on January 4 to the Palestine journal, which is affiliated with the Hamas terrorist group, Bkeirat claimed that "the construction of the false Temple is closer than ever before." Bkeirat claimed in the interview that an analysis of Jerusalem's development plans finds there is an intention to Judaize the Al-Aqsa Mosque, and within this framework build the Temple on its ruins and to then reduce the number of Arab residents in the city. In order to deal with the "danger" of such a move, he called to increase the Muslim presence in the Al-Aqsa Mosque and hold educational programs in it, in addition to public relations activities about the importance of the mosque and the other Islamic holy places in Jerusalem. Arabs continuously accuse Israel of "Judaizing" the Temple Mount, sometimes resorting to ridiculous propaganda such as accusing Israel of using chemicals to erode the foundations of the mosque in order to cause it to collapse. Meanwhile the Waqf, which was left in charge of the Temple Mount following Jerusalem’s reunification in 1967, has removed every sign of ancient Jewish presence at the Jewish holy site. The decision to leave the Temple Mount in the hands of the Waqf was made by then-Defense Minister Moshe Dayan. At the entrance to the Temple Mount, a Waqf sign says, “The Al-Aqsa Mosque courtyard and everything in it is Islamic property”. Police, in an attempt to appease the Waqf, discriminate against Jews. They limit the number of Jewish worshippers allowed on the Temple Mount at one time in order to prevent conflict with Muslim worshippers. They often close the Mount to Jews in response to Muslim riots – despite evidence that Muslim riots have been planned in advance for the specific purpose of forcing Jews out. 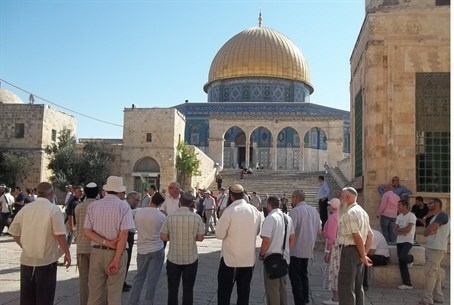 A recent report by archaeologists found that the Waqf is continuing to destroy Jewish antiquities on the Temple Mount in a direct violation of a ruling by the Supreme Court.